I need cartridges for the Epson LX-300+ printer model? Crystal clear, fast and reliable prints are what the Epson LX-300 is renowned for. One of these days your Epson LX-300 will use all of your printer ink, and when that does happen you'll quickly discover that ordering Epson LX-300 ink tends to be really costly. Thankfully, however, you have no reason to panic about forking out the steep costs you'll find on the main street because right here at Cartridge Save you can buy all the Epson LX 300 cartridges you'll need at really small prices. Start saving money on your ink by purchasing with Cartridge Save! Why pay high prices for the LX-300 original cartridge or LX-300 compatible ink down the main street when you could save a bunch of money shopping online with Cartridge Save. You enjoy utter peace of mind when you purchase LX300 ink cartridges from us as everything is protected by a quibble-free money back guarantee. Remember that each and every order comes with free delivery, typically arriving on your doorstep next day! The reliable Epson LX-300 impact printer can suit the printing needs of specific businesses, such as banks. This dot matrix printer uses 9 pins and delivers quick and good quality output. The Epson LX 300 uses the dot matrix printing method and a bi-directional print direction. It offers continuous printing, making it ideal for accounting firms and banks. Dot matrix printers have largely been replaced by inkjet printers, though, so finding consumables and parts may be hard. 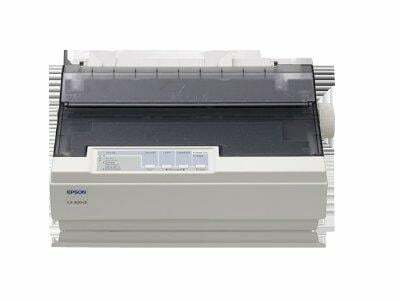 The simple Epson LX-300 dot-matrix printer weighs only 4 kg and has dimensions of 366 x 275 x 132 mm. It uses fabric ribbon cartridges. The Epson LX-300 has a speed of 220 cps for draft 10cpi and it can handle continuous paper as wide as 101.6-254 mm. This unit can also handle cut sheet size with a length of 182 x 364 mm. The Epson LX-300 can make one original plus 2 copies. For connectivity, a parallel port is on the back. Most businesses favour impact printers like the Epson LX-300 dot-matrix colour printer for its reliability. The LX300 impact printer is easy to setup, install, and operate – it has an organised control panel on the front. The Epson LX-300 ribbon printer is quick and output is decent. Fabric ribbons for the Epson LX300 can be purchased in black and colour and some online suppliers do a multipack of these ink ribbons to save users time and expense. Matrix printers are rare these days, so it can be challenging to find ribbons and replacement parts. The Epson LX-300 printer is no different and has been surpassed by laser printers and inkjet printers in terms of capabilities and output.